Sister M. Paul Bernard Blankemeyer, I.H.M. 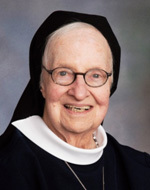 Sister Paul Bernard Blankemeyer, I.H.M., died June 27 in Camilla Hall, Immaculata, in the 71st year of her religious life. She was 95 years old. Born in Philadelphia, Sister Paul Bernard entered the congregation of the Sisters, Servants of the Immaculate Heart of Mary in 1944 from St. Laurence Parish, Upper Darby, and professed her vows in 1946. She taught at Villa Maria in Virginia, St. Aloysius Academy in Bryn Mawr and Annunciation B.V.M. School in Philadelphia before her assignment to Camilla Hall in 1979. The funeral Mass was celebrated Thursday, July 2 at Camilla Hall. Father William E. Dean was the celebrant and homilist. The concelebrants were Msgr. Joseph Logrip and Father Joseph P. McLaughlin, O.Praem. Sister Paul Bernard is survived by members of her I.H.M. community, her sister, Sister Mary Stanislaus, I.H.M., her sisters-in-law Peggy (Harry), Dolly (Robert), brother-in-law Richard Fackler (Clare) and many loving nieces, nephews, grandnieces and grandnephews. She was predeceased by her parents, Vincent and Anna Flora McGarity Blankemeyer, her brothers, Paul (Lynn), William (Sally), Robert and her sisters, Sister Anna Cecilia, S.N.D., Clare Fackler and Cecilia Blankemeyer.